The latest addition to our kitchen sees the wonderful Ninja Coffee Bar. Not to be confused with your average coffee machine, the Ninja Coffee Bar offers a vast selection of drinks to fit any taste or preference. This handy machine allows for the easy creation of espressos and Americanos, and even coffee shop favourites such as cappuccinos, lattes and macchiatos with its in-built Ninja MicroFrother. This ingenious solution delivers perfectly warm and frothy milk every single time. 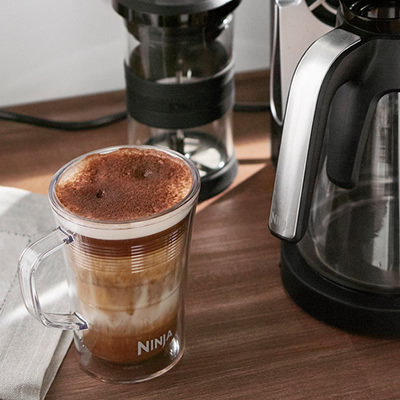 The Ninja Coffee Bar is exceptionally easy to use, with buttons that allow you to choose the size, strength and addition of milk as you see fit. 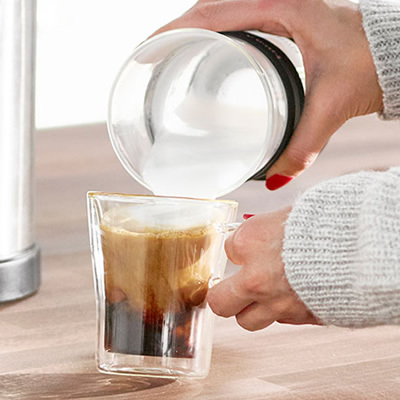 Not only that, but the separate attachments and coffee carafe are dishwasher safe, meaning keeping the Ninja Coffee Bar clean is an absolute breeze. 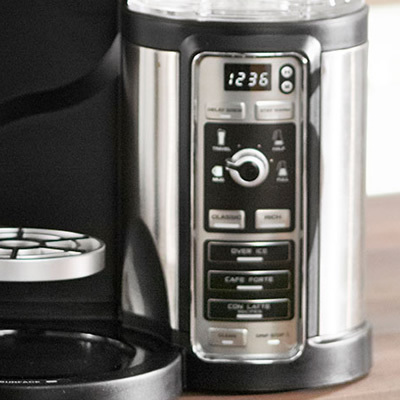 The coffee carafe sits on top of a hot plate, which allows you to keep your coffee warm and fresh for up to 30 minutes after it has been brewed. This is perfect for lazy weekend mornings, when you might just pop back for that second cup whilst reading the paper. 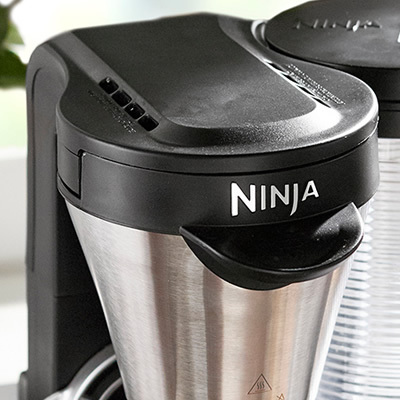 We’ve pleasantly surprised many a guest since we’ve added the Ninja Coffee Bar to our kitchen gadgets. With over 40 recipes available, there really is something for everyone, the possibilities are vast, and we couldn’t be any happier to show them off. Luckily the Ninja Coffee Bar works quickly, so even unexpected visitors can be treated to a proper coffee experience. We have been impressed by the Ninja Coffee Bar and it has become quite the talking point. The beauty of it is the range of possibilities it comes with. This flexibility is what sets it aside from the coffee pod machine trend, and is also why it comes highly recommended by us as a fantastic people pleaser and a fine addition to any kitchen. Alongside the Ninja Coffee Bar, we decided to treat ourselves to a coffee subscription, which we believe is a must should you be looking to purchase a proper coffee machine. We chose to go with the Extract Coffee Roasters subscription, which was very easy to set up. You can choose how regularly you would like your coffee to arrive, perhaps every couple of weeks, or on a monthly basis; whatever suits your needs. With the Extract Coffee Roaster subscription, you can also choose your preference in terms of beans. Whether you require whole beans, espresso ground, filter ground or cafetiere ground, they have something for all your coffee needs. And, of course, you can pick your strengths, so whether you have a household of strong coffee drinkers, mild coffee drinkers, or a combination of both, there will be the perfect coffee products available for you. Once you have selected your preferences you will also have the chance to change it up a bit and receive a different choice of coffee on each delivery, offering you the chance to experience their best picks over a period of time rather than the same each time. Although of course you can receive the same each time, should this be your preference. Along with each delivery you will also receive detailed notes about the coffee you receive and its origin, along with the tasting notes and flavours you can expect to taste. This information offers a great talking point, as we’ve been able to give guests a few facts about the coffee their drinking, which is both interesting and informative. We cannot speak highly enough of this service and believe it’s the perfect gift for any coffee connoisseur, or even just yourself! It’s changed the way we consume our coffee and has opened our eyes to potential new coffee tastes and experiences we would never have come across had we continued to buy the same coffee from the same shop. It has encouraged us to learn more about the art of coffee making, and the complexities that are involved in creating the perfect cup of coffee.